We have just added support for the new ESP32 chip to VisualGDB. While VisualGDB allows building projects, setting breakpoints and debugging your ESP32 code out-of-the-box, the ESP32 tools come with a few known limitations that may interfere with debugging. In this post I will summarize them and show known workarounds. The biggest problem of the ESP32 chip is that it cannot be reliably reset into a predictable initial state. Programming the SPI FLASH requires putting the chip in a state where the background tasks are stopped, FLASH is initialized properly and the interrupts are disabled. Unlike ARM devices that enter this state immediately after reset, ESP32 does not allow doing it easily. Resetting just the CPU leaves the peripherals in an unpredictable state that often results in a crash and resetting the entire chip immediately starts the CPU, so by the time VisualGDB can stop it, it has already begun running some code. VisualGDB works around this by doing a chip reset and halting both CPUs some time after it, but this does not work 100% reliably. Put the chip in the bootloader mode (hold the bootloader button, press the reset button). Start JTAG debugging. The memory should get programmed, but the chip will not leave the bootloader mode without a physical reset. Reset the chip by pressing the Reset button. VisualGDB will automatically detect the code that is placed in RAM and will use software breakpoints instead of hardware ones for it. 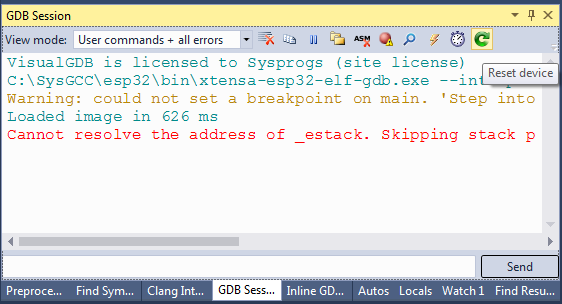 Viewing local variables and call stack will work, but trying to continue debugging will result in a random effect from stopping at the same place in code to crashing gdb. 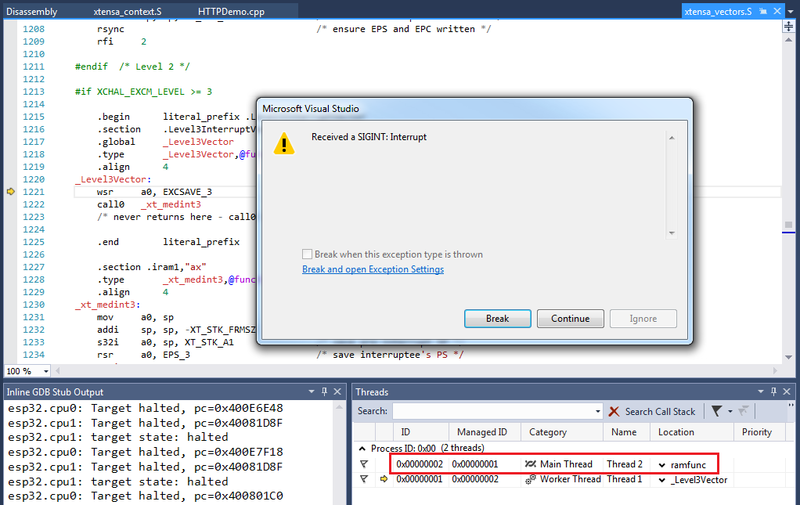 The workaround would be to disable the breakpoint, optionally set another on on the next line, resume execution with F5 and reenable the original breakpoint once the next breakpoint is hit. We have experimented with modifying OpenOCD to report the correct core in the ‘session stopped’ event, but this often results in crashing the firmware, so as of November 2016, the core that triggered the breakpoint needs to be selected manually. ../../../../src/gdb-7.10/gdb/inline-frame.c:167: internal-error: inline_frame_this_id: Assertion `frame_id_p (*this_id)' failed. 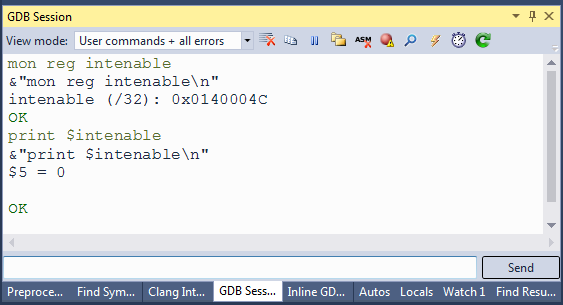 The suggested workaround is to disable function inlining for the source files you are debugging. Despite the few shortcomings shown here, Espressif has done a great job open-sourcing most of the ESP32 libraries in the ESP-IDF framework and providing an OpenOCD version that can provide basic debugging functionality. The version shipped with VisualGDB contains a few stability improvements over the original one and can be found in our Github repository. We will be contacting Espressif regarding the issues in the ESP32 tools and will post updates here once better workarounds are available.